We’ve said it before: Vampire Diaries costars Nina Dobrev and Ian Somerhalder work hard at their relationship. When they aren’t on set, they’re often on opposite sides of the country doing promotional work, and that puts a lot of strain on a relationship! They were just crowned Hollywood royalty, and are top fan picks for the upcoming Fifty Shades of Grey movie. But is life in the spotlight putting too much pressure on their relationship? The couple spent Saturday afternoon in a bitter fight, but we think their relationship will be just fine! Ian hasn’t responded to her flirty threat, but is excited for the work break. Yesterday, he tweeted, “Wrapped! New Orleans get ready… Here I come” Though Ian plays super-strong vampire Damon, while Elena always needs saving, we expect real life will be quite different. Nina is a sports junkie, former gymnast, and grew up under the tutelage of a big brother. Don’t underestimate her! Of course, it won’t hurt that each team gets NFL professional players! 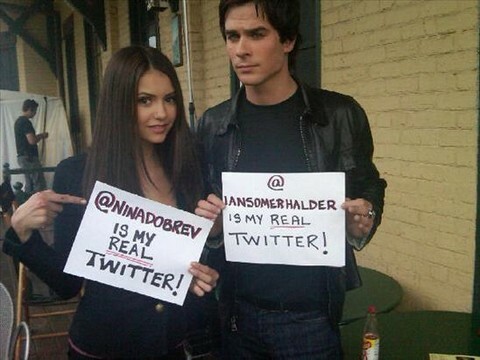 It’s rare to see a couple as down to earth as Ian and Nina, and we love how flirty she is on Twitter! It seems to me that the age of high-strung, inaccessible celebrity snobs is ending! They’re all on Twitter, greeting fans, being human, and sharing their lives. Do you like Ian and Nina as a couple? Would you like them on-screen in Fifty Shades?